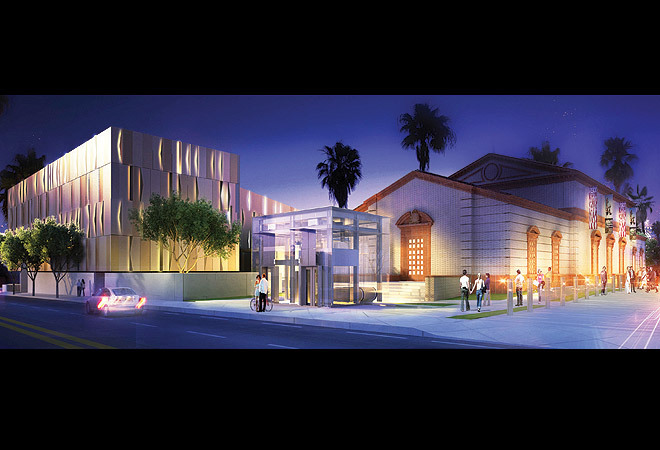 Opening this month, the Wallis Annenberg Center for the Performing Arts promises to be an au courant cultural destination that features opera, dance, theater, and an educational program. But for architect Zoltan Pali, the transformation of the Beverly Hills Post Office required a thorough study of the building’s history. “We were very careful, very surgical,” says Pali, whose award-winning firm, SPF:a, restored the Getty Villa and has plans to create the Academy Museum at LACMA West in 2014. Those who remember the 1933 Italianate post office, which closed mail operations in 1999, will notice that the original lobby remains intact, including the structure’s columns and three New Deal-era murals by artist Charles Kassler. What was once the P.O. box area is now home to a café, and the counter that had dispensed postage stamps sells tickets today. Even the wavy exterior of the adjacent Goldsmith Theater was designed with the written word in mind. “I started imagining all the letters that came through,” says Pali, “and I thought, ‘What if all those envelopes came back to clad the new building?’ So when you look at the architecture, it’s an abstraction of that idea.” Duly noted. Next articleHayrides & Comedy & Pet Sounds: 20 Ways to Spend the Weekend in L.A.